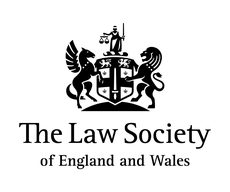 Is the firm regulated by the SRA (Solicitor’s Regulation Authority)? Is the firm a member of the Conveyancing Quality Scheme and can they act for my mortgage lender if applicable? What is the reputation of that firm? What do people say about them online and on their website? What is their service like? Do they have qualified and experienced people to handle my matter? Do they have a support team that will help get things done? Does this firm have insurance if anything goes wrong? How will I know what is happening throughout my matter – does the firm have a way of reporting the key stages to me? Once you are certain you have chosen the right firm for you, it is then a good idea to compare the cost of the service you will receive. Our legal fees depend on the value of the property. If you call or email us we can give you an instant estimate that shows you all of the costs involved. 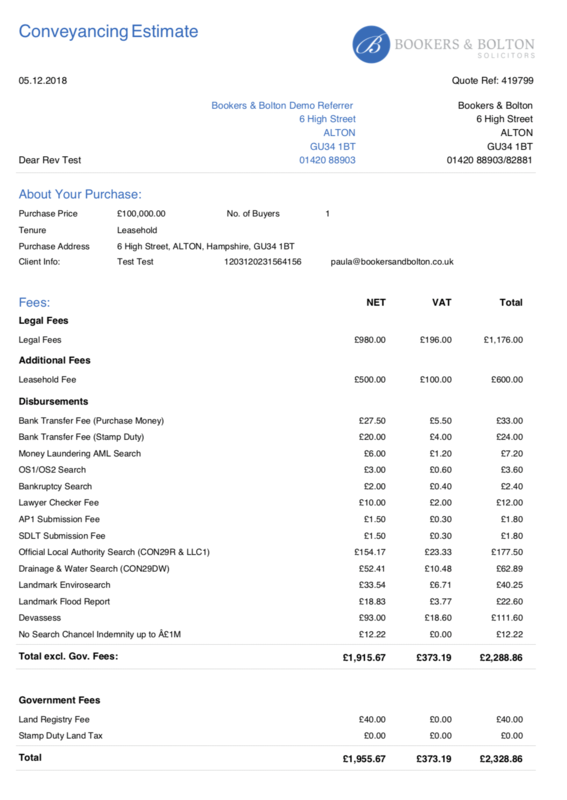 You can see here a sample estimate for a property valued at £100,000 that shows you the costs involved, including all legal fees and disbursements related to your matter. This depends on the purchase price of your property. You can calculate the amount you will need to pay by using HMRC’s website or if the property is located in Wales by using the Welsh Revenue Authority’s website. Our instant estimates will also calculate this for you. It can be quicker or slower, depending on the parties in the chain. If you are a first time buyer, purchasing a new build property with a mortgage in principle however, this would be dependant on the stage of the build and when this has been signed off by the building regulation inspector, the developers can provide an indication of this when the plot is reserved but could take anything up to a year. How will I know what is happening throughout my matter – does the firm have a way of reporting the key states to me? Notice of Transfer fee – This fee if chargeable is referred to in the management pack. 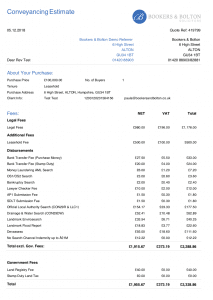 Often the fee is between £60-£150.00 plus vat. Notice of Charge fee (if the property is to be mortgaged) – This fee again is set out in the management pack. 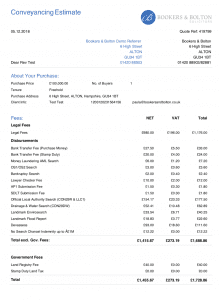 Often the fee is between £60-£150.00 plus vat. Deed of Covenant fee – This fee is provided by the management company for the property and can be difficult to estimate. Often it is between £150.00 and £300.00 plus vat. Certificate of Compliance fee – This fee is set out in the management pack and can range between £60.00 – £120.00 plus vat. *These fees vary from property to property and can on occasion be significantly more than the ranges given above. 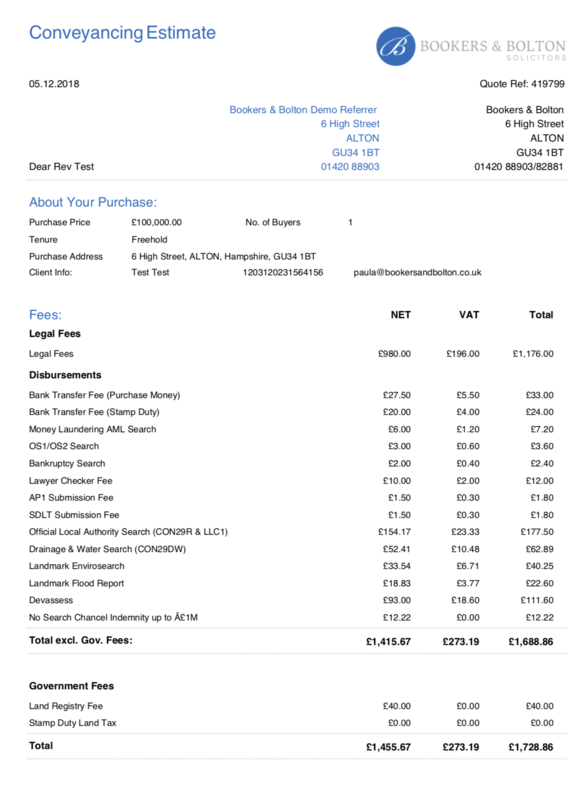 We can give you an accurate figure once we have sight of the management pack from the freeholder/management company. How long it will take from your offer being accepted until you can move in to your house will depend on a number of factors. The average process takes between 10-12 weeks. It can be quicker or slower, depending on the parties in the chain. If you are a first time buyer, purchasing a new build property with a mortgage in principle however, this would be dependant on the stage of the build and when this has been signed off by the building regulation inspector, the developers can provide an indication of this when the plot is reserved but could take anything up to a year. If you are buying a leasehold property that requires an extension of the lease, this can take between 3 and 6 months. In such, a situation additional charges would apply. All legal work will only be carried out by our qualified lawyers and over-seen by our Head of Property and the Senior Partner. Our dedicated and experienced support team carry out all administrative tasks so that your lawyer can concentrate on getting the legal work done. You will receive a full list of who is responsible for your matter upon instruction. We are happy to discuss this with you and for you to meet the team at any point. We do not pay referral fees to estate agents as we believe that our fantastic service speaks for itself. We want you to have confidence in us, that comes from knowing anyone who refers us, does so because we are good – not because we have paid. Our fees are calculated on a ‘time-spent’ basis rather than being based on a percentage of the value of the estate. As such every estate is different and the estimated fees depend very much on the complexity of the estate. We will always give an estimate at our first meeting. We estimate that if you require us to obtain a grant of probate only and you are happy to deal with the remainder of the estate, our fees will be between £1,000 – £1,500 plus VAT. We anticipate that a simple case will take between 6 and 15 hours work at £275 per hour. Total costs would be estimated at between £1,500 – £4,000 (+VAT). A simple case would often, but not always, be an estate with no trusts where no inheritance tax is due and the assets pass to a surviving spouse or a small number of beneficiaries. The average number and type of assets in this kind of estate would range from including; a property, a couple of bank accounts, a couple of shareholdings, a life policy and a private pension. We anticipate that the majority of more complex cases will take between 15 hours and 25 hours work at £275 per hour. Total costs would be estimated at £4,000 – £7,000 (+VAT). The most complex cases taking longer than 25 hours work will cost more than £7,000 (+VAT). The complexity of an estate will depend on many of the following factors: whether inheritance tax is payable, if there is a large number of beneficiaries or assets, if there are labour intensive assets (for example a property that we need to clear), if there are a large number of individual shareholdings outside of a portfolio, if there is more than one property or rental properties, if there are foreign assets, if there is a business, if there are related trusts, if there are negotiations required with DWP or HM Revenue & Customs or the District Valuer, if there are complex tax calculations (for example income or capital gains tax). These are costs that will be incurred by the estate that have to be paid to a third party, such as the Land Registry or court fees. We handle the payment of the disbursements on your behalf to ensure a smoother process. The timescales for finalising an estate are difficult to predict accurately, particularly if there is a property that needs to be sold, but as a guide a simple case can often be finalised within 3 – 6 months, most more complex estate between 6 months to a year, and many of the most complicated estates will take over a year. None of the above fee estimates include conveyancing fees which are estimated separately, and the estimates are made assuming that there are no claims against the estate or disagreements between beneficiaries or executors, we are able to easily contact and/or trace all assets and beneficiaries, and we receive timely responses from executors, beneficiaries, HMRC and other third parties. There will be an additional charge for attending a Tribunal Hearing of £500 per day (excluding VAT). Generally, we would allow 1-3 days depending on the complexity of your case. The time that it takes from taking your initial instructions to the final resolution of your matter depends largely on the stage at which your case is resolved. If a settlement is reached during pre-claim conciliation, your case is likely to take 2-3 weeks. If your claim proceeds to a Final Hearing, your case is likely to take 20-40 weeks. This is just an estimate and we will of course be able to give you a more accurate timescale once we have more information and as the matter progresses. Matters usually take 3-5 weeks from receipt of instructions from you to receipt of payment from the other side, depending on whether or not it is necessary to issue a claim. This is on the basis that the other side pays promptly on receipt of Judgement in default. If enforcement action is needed, the matter will take longer to resolve. If proceedings ned to be issued or other action taken we will charge at an hourly rate and provide an estimate of future costs. The Hourly rate may vary between £150-£300 plus VAT an hour depending on the size of the debt and the complexity of the facts of the case.